In addition to her own family of cats and dogs Debby often fosters two or three nursing mom cats with their kittens at a time at various ages and stages of socialization and a also few cattens and adults who need medication or treatment on top of those litters. She also loans traps to those who need them or helps to trap a cat or colony of cats who need to be rescued or brought in for TNR and taken to the clinic, transports cats to and from shelters and foster homes. On top of all that she is an expert seamstress and makes and donates stacks of cage hammocks and kick sticks and fleece blankets for the fosters in Pittsburgh C.A.T. and to sell or auction as a fundraiser for both organizations. Debby grew up on a farm where her parents still live, and was introduced to HCMT when Michelle Miller, who leads the efforts of HCMT and Pittsburgh C.A.T., came to help her parents TNR the feral colony on their farm. Debby offered to help and Michelle enlisted her as a foster home. In the past year Debby has fostered over 50 kittens and cats, and more than that in her history with HCMT and Pittsburgh C.A.T. And not just your average happy cat moms with healthy playful litters, but feral mother cats with their newborns who need to be handled for socialization and adoption as they grow, while the mother cat will be spayed and released to her caretaker, a very delicate situation to say the least. Aside from a lack of socialization are often litters who are literally starving and dehydrated, possibly with very common upper respiratory infections that require weeks of medication and often supplemental feeding with formula for the mother cat and the kittens or they would not survive. Then are the kittens who have no mom at all and who need to be bottle fed and nurtured and socialized so they are nice round healthy playful kittens at about eight weeks to be spayed or neutered and put up for adoption. Then there was the ringworm litter...they turned out fine, and no one else developed ringworm including Debby! Debby lives in Hays, just past the South Side along the Monongahela River, and while she has found plenty of cats in her own area she also helps cats and people in the south hills and communities along the river, delivering traps and rescuing cats. Her house is on a seven-acre hillside and began with an abandoned cinder block garage that she and her husband Rich, a contractor and carpenter, together completely remade into a spacious and elegant home with many rooms and also built a finished and heated garage. That's how all those cats with their individual needs and illnesses can be kept separate, and fostering often means moving from one room to another to the garage and back, all day long, and keeping them all separate from her own family of animals. Right now she has 16 fosters in the house: two litters, four and three, with medications for URI and a momma and three nine-week old kittens also with URIs needing meds. And when another rescuer who feeds a feral colony opened one of her winter cat shelters to change the straw and found—surprise!--a litter of week old kittens, Debby offered to foster them and their feral mom until the kittens are old enough to leave; the mom will be spayed and returned to her caretaker. In addition she is working with people in Baldwin, Greenfield and Homestead//Munhall to assess, trap and treat cats they are caring for. Debby never worked with cats in particular but growing up on a working farm surrounded by cats, dogs, cows, hogs, etc. she is familiar with animals and their needs and personalities, and along with that knowledge of the ways of animals and growing things, she also learned the “lady skills”—sewing, knitting, crocheting, embroidery and cross-stitch and more. She has a degree in Interior Design and worked in that field for over 20 years but is now retired from it though she still puts those skills to use with cat beds and hammocks for the rescues, and also in making insulated shelters for colony cats. 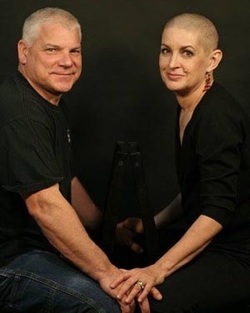 She is also a breast cancer survivor after multiple surgeries, and her photo shows her “rocking her bald head” after one of her surgeries a few years ago along with her husband Rich. Her husband is “an awesome support” in her cat rescue and foster, interacting with all the fosters for socialization and building the special cage for the litter with ringworm along with carrying the load when she's busy taking care of cats. Her parents also give her financial support for rescue and foster...and traps too! She and Rich currently have eight cats: Agent Orange, Nomad, Bobbi, Lily, Iris, Daisy, Calle and Helen, and two very large dogs, Shelby at 15+ and Obie, 10. Debby was part of the Ford City TNR project in January 2014 where the Frankie's Friends mobile spay/neuter unit went to a remote trailer park and volunteers from HCMT trapped 103 cats for spay/neuter and veterinary treatment in a foot of snow and temperatures at 10 degrees and lower over two days. She was also a foster to a big unneutered male tabby cat rescued with an injury who turned out to be FIV+ and a cuddly kitty who thoroughly enjoyed living in a house with people. Polydactyl Nomad proved irresistible to her and to Rich and he quickly became a member of the household. But one of the cats Debby rescued and will never forget is Gracen, who she found at age 10 in her own neighborhood and took from a neighbor who was moving. Gracen had been declawed but not spayed and was left to live outdoors by that neighbor, having kittens who did not survive. After having Gracen spayed and sending her back to that household Gracen was returned for behavior and fostered again by Debby and Rich. Debby found a mammary mass on Gracen which was removed, then after recovery Gracen was adopted briefly for an elderly woman, but Gracen hid and was again returned. A few months later it became apparent her cancer had returned and she was put to sleep, though she will always rest in one of Debby's flower gardens along with a number of cats from other rescuers.